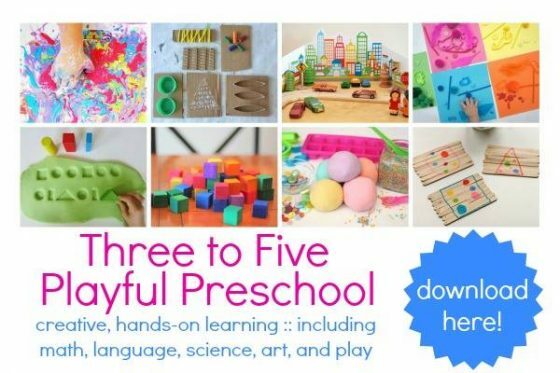 What if I told you your kids could have a great craft session with about 2 minutes of prep and virtually no clean up. Sound too good to be true? Well, believe it! Crafting with the kids doesn’t get any easier than this! 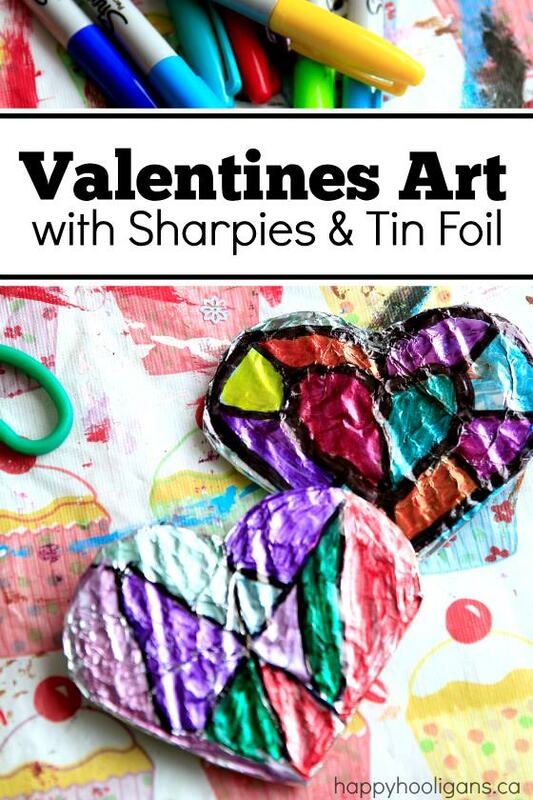 Making Valentines art with Sharpies and tin foil is super-simple but it’s really cool. It’s slick, it’s shimmery, and the process is fun and addictive. This simple art activity is a great craft for Valentines Day, but you can tweak it for your kids to make for any theme or holiday by changing the shape of the pieces they’ll be decorating. 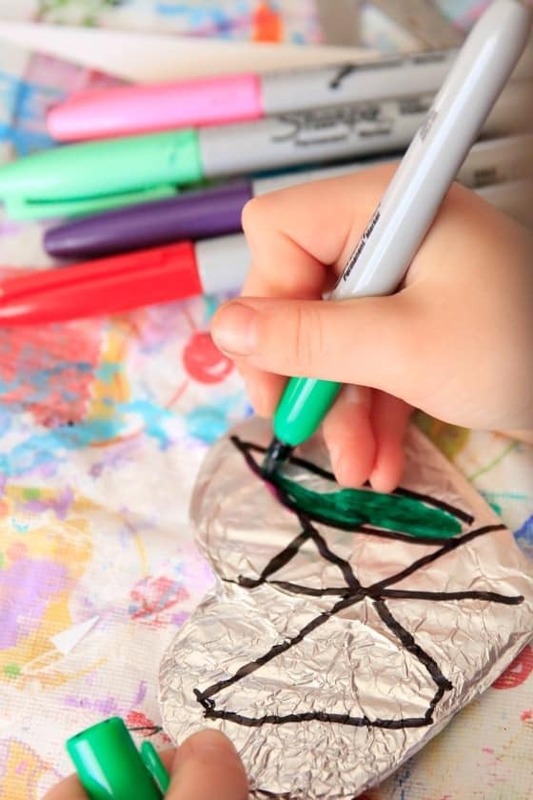 Colouring with Sharpies on tin foil is one of our favourite ways to make art. It’s terrific for those times when your kids want to get crafty but you don’t want a whole lot of mess. 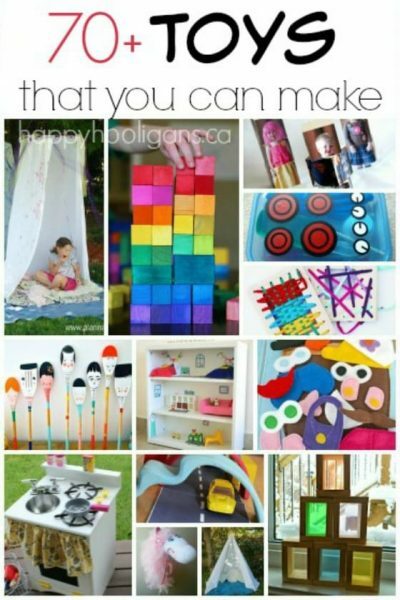 It’s a great project for a group of kids too, like an art class or a craft party because the supplies are so minimal. All you need are Sharpies and tin foil. Well, you’ll need some cardboard too, but you can raid your recycle box for that. Bonus: It’s a rather addictive craft. It could keep the kids busy for a while. Betcha can’t make just one! We’ve used this art process to make simple Valentines ornaments today, but if your kids are in the mood for a bigger, have a look at the Name Art we made with Sharpies and Tin Foil last year. What a terrific activity! One of the coolest things about using Sharpies with tin foil is how a Sharpie marker glides across the slippery foil. It’s a really neat sensation; kind of like sensory colouring. It’s also very cool how shiny and iridescent the ink looks on the foil. People have asked me if watercolour markers (like Crayolas) can be used for this project. We’ve always used Sharpies, so I can’t say for sure, but I suspect watercolour ink would smudge or rub off easily. I’d go with permanent markers – preferably Sharpies because we’ve tried and tested them and they work great. Ok, let me show you what you’re going to need today, and how we made these pretty Valentines ornaments. Using your stencil, trace a heart onto a sturdy piece of cardboard, and then cut it out. Next, lay a piece of foil on a flat surface like a table or countertop. 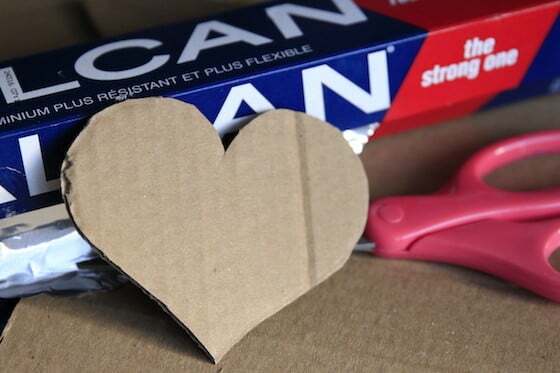 Lay the cardboard heart in the center of the foil, and wrap the excess foil to the backside of the heart, crushing the foil together so it will stay in place. Try to keep the front side of your heart as smooth and crease-free as you can during this process. Press and smooth the edges of your heart until the shape looks good. Be gentle pressing the foil into the indent at the top of the heart. It can rip easily there. Now it’s time to colour! On the smooth side of the heart, have your child colour whatever design they please. We often use a black Sharpie to make sections all over the foil, and then use a different colours to colour in the sections. This makes for a stained glass kind of look. I like that kids of any age can do this project. 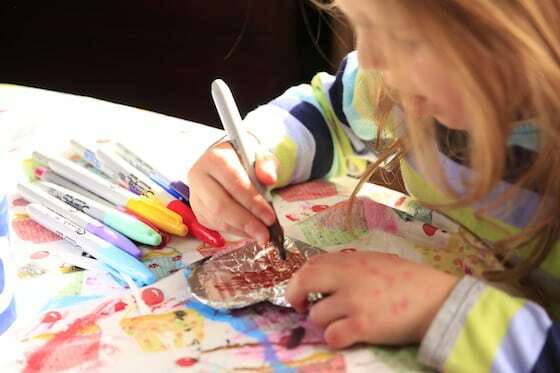 Really young children can scribble and colour all over the foil while older kids can make detailed and intricate designs. Heck, even the grown-ups will love this craft. I can’t resist joining in on a good Tin Foil and Sharpie Art project. When their hearts are finished, your kids can think up creative things to make with them. They could punch holes in them, and string them into a garland. They could add a length of ribbon or twine, and make a necklace, or you can do what we did with our Tin Foil and Sharpie Fall Leaf project. 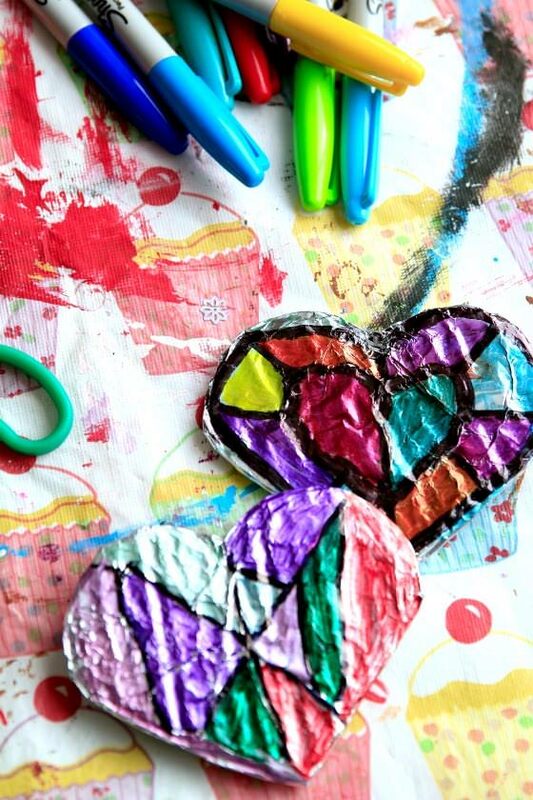 You could use a bunch of your tin foil hearts to make a colourful mobile to hang in your home or classroom! How fun and easy was that?! If you and your kids make some art with Sharpies and tin foil, be sure to let me know. Better yet, share some photos of the process and the results with the HH community on my Facebook page!